Q: Can you tell us what led you to the arts, specifically to theater? Marcel: I’ve had a love of the spoken word, especially drama, since elementary school. I have wonderful memories of the fun things we did at school, like Gilbert and Sullivan’s HMS Pinafore. We didn’t have a drama club in high school, but we did creative expression as part of debate, and I remember reading Patrick Henry’s famous speech, “Give me liberty or give me death.” I loved to enter into the consciousness of great souls, and Patrick Henry was definitely a great one. At college in the greater New York area, I minored in drama. I directed several plays and acted in off-off-Broadway productions, and did dramatic and poetry readings at cafes. I ran around with a group of theater people who were brilliant in their work, though they would never be famous, and I enjoyed it all very much. Marcel Hernandez – Click to enlarge. I wrote a play about an encounter between a Jewish Nazi hunter and a Nazi, and the dialogue that leads them to understand each other’s position. I called it “To Avenge.” It was produced on Public Television in the New York City area as part of a series for young playwrights. Someone in the Stanford Drama Department apparently saw it, because the department head and his staff were touring the country, and they interviewed me and had me do a dramatic reading. They offered me a full-ride scholarship and a Master of Fine Arts degree if I would do some writing, directing, and acting with the Stanford Repertory Company. I had gotten away from writing, but I completed the course work and did some acting and directing, and they gave me the MFA. 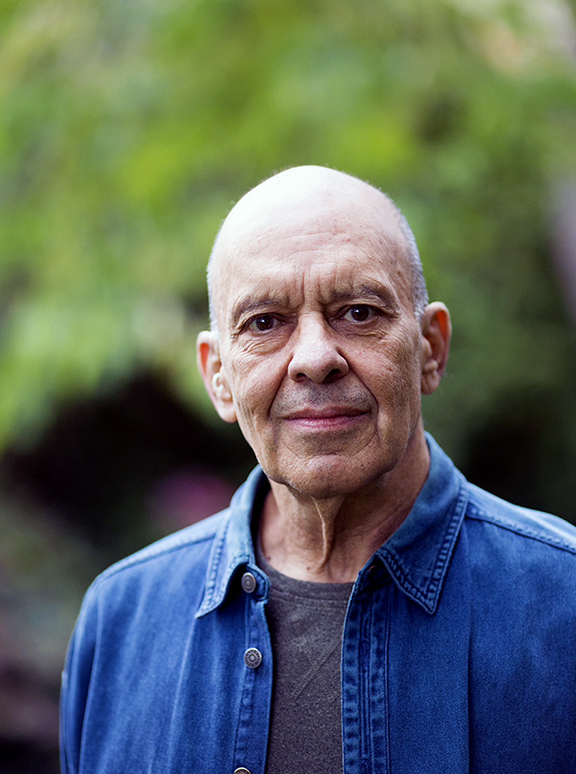 After Stanford, I continued to be involved in theater, directing some community theater, and being accepted by the Santa Maria Shakespeare Festival in 1972. As a young man, I had been very shy. Drama had helped me come out of my shell, but by 1972 I realized I no longer needed it, and it was time to move on, so I dropped out of the Santa Maria festival organization. Also, I felt increasingly constricted by the consciousness of the people I was spending time with. I felt there had to be more to life than courting people’s applause, which is a motivator for lots of people in theater. I then got together with friends in the Bay Area, and we started The Roanoke Company, after the Roanoke Company in Virginia that mysteriously vanished in the 1600s. We felt that our company would eventually disappear, too – as it did. We ran political campaigns for people and causes that we felt were doing something positive for the planet. I remember driving Jimmy Carter in my VW Bus to environmental meetings in San Francisco. I worked for Governor Jerry Brown’s administration, helping them figure out how to spend $24 million on urban parks. He sent me out to conduct studies, and I met with the mayors of the major California cities. We left for India in 1977. After our pilgrimage we settled in Japan for seven years, and when we returned to the U.S. we both entered medical school. It had been a major interest of mine, I suspect partly because of the long line of doctors, pharmacists, and healers in my Cuban family. In 1919, my grandfather gave a speech to his fellow pharmacists in which he predicted that the advent of pharmaceutical drugs would destroy the health of humans. I have a transcript of the talk, which I translated and printed in a health and spiritual wellness journal that Connie and I published while we were in Japan. I’m very happy in medicine – I love what I’m doing and wouldn’t think of doing anything else, unless Divine Mother were to guide me. 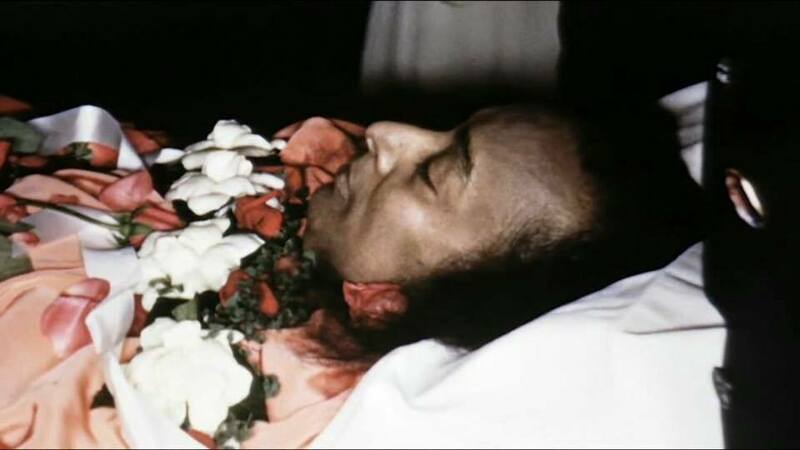 To turn back the clock, in 1952, when I was nine years old, I opened a national magazine whose name I’ve forgotten and found an article titled “The Incorruptible Saint.” A photo showed Paramhansa Yogananda in his casket, and the article described how the aroma of roses permeated the room. I can’t talk about it without getting choked up, because it was such a significant event in my life, and I can still feel the impact. Paramhansa Yogananda mahasamadhi, 1952. Click to enlarge. The photo showed Master in his casket with roses all around, his devotees in the background, the nuns dressed in white, and it transported me to another realm. I remember thinking, “Wow, the incorruptible saint!” Because for the twenty-six days until the casket was sealed his body remained uncorrupted. Autobiography of a Yogi had a life-changing impact on me, as of course it has had on so many thousands around the globe. And after that first reading I began to think about trying to open my inner doors. I loved Sufi dancing. It was an outlet from my political work, and a way of balancing the damage that politics was doing to my consciousness. But as soon as they would start talking about God in their discourses, I would quietly leave and go for a walk. I loved the upward connection that I felt from the dancing, but because of the cynicism that politics had instilled, I was completely turned off from hearing anyone talk about God. From my present perspective, I can see that the world of politics is devoid of spiritual focus. Reading the headlines today, it’s clear that there simply is no upward aspiration in that world. In the early 1970s I lost my way spiritually, but when my friend gave me the Autobiography, I immediately recognized Yogananda from the article I had read when I was nine, and I said, “Wow, this is amazing!” But my heart still refused to open. 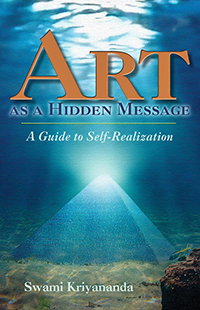 That was when I began to recognize an urgent need to open my heart to a spiritual reality, and it sparked the journey that eventually brought me to Master and Ananda. Land of Golden Sunshine. Click to enlarge. Fast-forward a little over a decade, and 1993 found us practicing medicine in Vermont and feeling terribly isolated because of the harsh winters that force everybody to stay indoors all day. At the time, East West Bookshop was on El Camino Real in Menlo Park. I loved the store and had been a customer for many years. And when I flew to the Bay Area to look for housing I visited East West, and the checkout person, who would become my dear Ananda friend Vasudeva, put a flyer in my bag announcing that the Palo Alto Ananda community was seeking like-minded spiritual people to live there. I immediately called and talked with Sudarshan, who served as co-manager of the community, along with Chidambar and Gary McSweeney. When I came for a visit and saw what a powerfully inspirational place it was, I was overjoyed and put my money down, because I recognized that it was exactly what we needed. Before deciding to move to the community, I had spent days making the rounds of the private and public schools in the Bay Area, looking for the right situation for our five-year-old son, and growing increasingly depressed. Our son had attended a wonderful school in Vermont that had a strong upward focus, and I was feeling terribly dejected about not being able to find a situation that would address his needs on every level, social, academic, and spiritual. Then I walked into the Living Wisdom School. (laughs) It had recently opened and was in temporary quarters on the grounds of a former public school. I walked in and saw the kids running around doing amazingly creative things, full of joy, and I burst into tears right there in the classroom in front of the teacher and the kids, because it was exactly what I wanted for our son. The Ananda church brought me to the teachings of the great soul with whom I had come in contact so many years earlier through the magazine article. After attending services at the church for several years, I had the thought that the ministers might welcome some help with the Christmas pageantry. I said, “I’ll have to think about it.” Because I had left drama behind and didn’t want to go anywhere near that scene. I had long since passed the point of wanting to court people’s applause and recognition. I meditated and prayed and thought and wrote about it, and after six months I said to Asha, “I’ll do it, but on my terms – I don’t want any recognition. I want to be in the background, and that will be my approach.” She agreed, and the Palo Alto Ananda Players were born. I’ve had to adjust my stance, because the players won’t allow me to stay too far in the background. But the more we’ve done, the more thrilled I am, because I’ve discovered that I have no desire for recognition, but only to know that what we’re doing is upwardly focused, and that it is touching hearts and helping introduce people to God. I feel that it’s a major part of my life’s mission. Divine Mother gives us each certain gifts that we can use to expand our hearts and touch the hearts of others, and I feel that She gave me insights in drama by which I can help people become aware of the Divinity that lives within us all. I was aware that the music ministry had brought many people to this path, and I was convinced that drama could do the same. Land of Golden Sunshine. Lisa’s dream. Click to enlarge. One of the great joys of working with the players is their eagerness to subordinate their egos to a common cause of inspiring and uplifting others. When we work together, there isn’t a focus on personal recognition, but on finding joy through self-offering and self-forgetfulness while making something beautiful that will uplift the audiences and give them hope. One of the definitions of “ensemble” is “a collection of parts that function as a whole.” And this is what I feel we’ve accomplished – especially, and very wonderfully with our most recent production, The Land of Golden Sunshine. It was a true unity of souls. 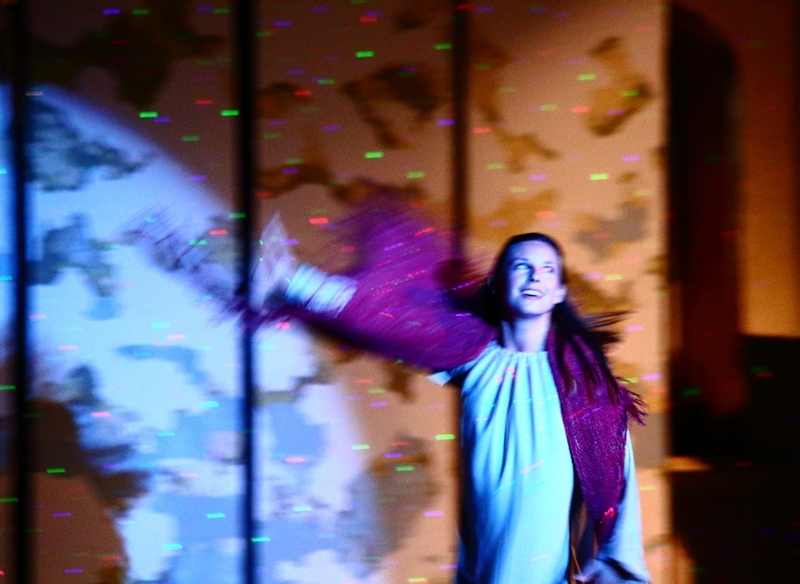 Karen G directed the music, Karen Beswick choreographed the dance, and with Asha’s insights and her inspired costume designs, and some brainwaves from Rammurti, we were able to create a magical ensemble where the impact of the performances was much greater than the individual parts. The two Karens and Asha and Rammurti and I had a wonderful unity of consciousness. And I smile as I think of those who lovingly volunteered so much of their energy and time: Chandra, Gopal, Dhananjaya, Ron, Navashen, Saiganesh, Gary McSweeney, David Praver, Amara, and many others. I especially have to include the tremendous inspiration of working with Kristy Norfleet, who played a key role until she fell sick. I feel that the highest kind of creative endeavor only becomes possible when we set our egos aside and invite a higher inspiration to guide us. How can we reach into someone’s heart and fill it with an uplifting message, and have it grow in their heart and change them? The kind of recognition that I can enjoy is when someone came up to me after Land of Golden Sunshine and said, “I feel closer to God as a result of being here tonight.” And I could only say a silent, “Yes!” Because – mission accomplished, spiritually speaking. At this point, I don’t see any purpose for the arts except to inspire. At Ananda, our goal is to live as close to God as we can, and to share His love and joy with others. And what higher purpose could there be for the arts than to help people discover that joy for themselves? It’s so easy for drama to become perverted for ego gratification. And you only have to look at the arts today, with the dearth of high purpose, to recognize how urgently something like this is needed. Q: After the Friday performance, Gopal said that he felt Swami Kriyananda’s presence guiding every slightest movement. There was no attachment to being right. 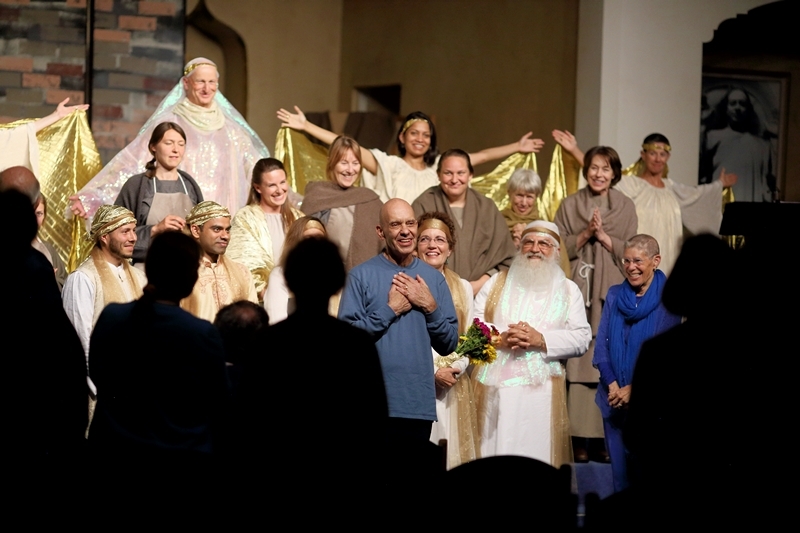 We were completely focused on making it the best we could, and true to Swami’s vision of helping people find their own higher happiness in God. As I mentioned, the joy of working with Ananda people arises out of their desire to serve. It makes for a radically different environment than my previous theater experience, where people were possessive about their roles and unable to forget themselves in service to a larger cause. 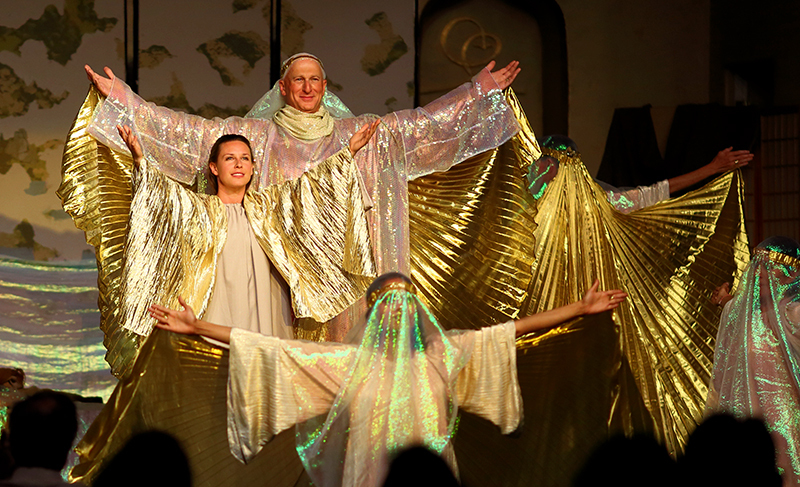 I’ve spoken of how this new approach to theater can touch people’s hearts, and open them to an experience of God. But I also feel it’s important to talk about what working intimately with Swamiji’s material can do for the cast and crew and dancers and musicians. With Land of Golden Sunshine there were extended periods during rehearsals and performances where we felt deeply in tune with each other and with Swamiji’s liberated consciousness, and where we repeatedly felt the presence of the Divine Mother. Land of Golden Sunshine. 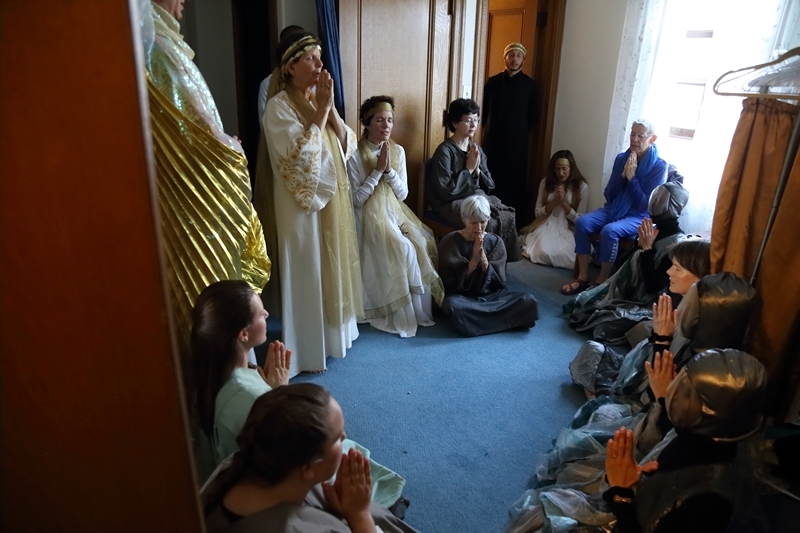 The players meditate before performing. Click to enlarge. Our friendships deepened, and the cast took immense strides in vulnerability and expression. Kshama and Steven became fearless, and more radiant than I had ever seen them. Rose was so convincing in the role of the crone that her own father didn’t recognize her. Vicki, who had never set foot on a stage, was able to surrender her rookie’s self-consciousness and give beautiful expression to her role. 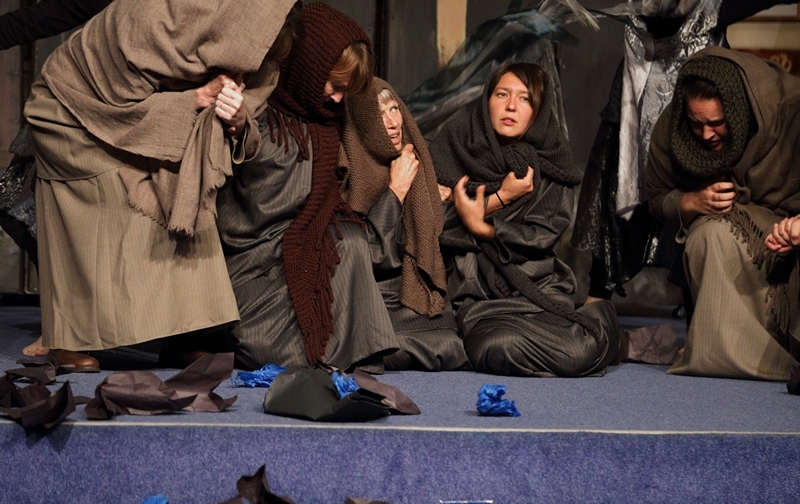 And the God-inspired women who portrayed the factory workers presented those lost souls with great compassion. Asha and I rarely disagree, and she’ll generally defer to me in matters of artistic and dramatic direction. But we do have animated discussions, because she’s an insightful, creative person with very high standards and a great deal of energy. For example, the Sun Dancers had white veils over their faces, because we wanted to suggest that they weren’t human – they were elementals. Then Asha wanted to put a veil on the Sun Man as well. But Steven had worked extremely hard to project the essence of the Sun Man through his facial expression, and after thinking about it I vetoed the idea of a veil for him. Steven played the role beautifully, and I feel a great deal of respect for that, because it required a huge leap in expression. To bring forth the glow that we saw in the Sun Man took a vulnerability, and an attunement to an inward presence of the Divine Mother that was profound and magical, and then he was able to release that inner experience for others to share. Q: Swami Kriyananda said that a spiritual community such as Ananda cannot communicate its essence to others, unless and until it can express it through the arts. If you want to move people, and not just spend hours explaining what you’re doing, the arts can provide a direct channel, and carry the message to people’s hearts in a very intimate way that they will intuitively understand. Marcel: I’ve been negligent in not talking about this – how the material that Swami has given us puts us miles ahead at the start, because it conveys its message very directly to people’s hearts. Asha worked closely with Swamiji for forty-five years, and she describes the utmost care he put into every syllable, and the sound and intonation of every word. It’s so pure and refined that it gives us a tremendous carrier wave that we can hitch ourselves to, and give people an intimate experience of inspiration. Land of Golden Sunshine. A grateful Marcel Hernandez. Click to enlarge. Marcel: It’s an indescribable joy to work with material that has so much spiritual power in it – such a pure and high vibration. I have some ideas for working with Yogananda’s words as well. Because, as I mentioned, this is the only type of material I’ll work with now. I see my role as simply to help nurture this new dramatic form so that the audiences and players can find their own higher inspiration. Several times, I’ve used the word “inspire.” I love the fact that the root meaning includes “to fill others with spiritual upliftment.” It was originally used to describe a divine or supernatural being blowing something into a person, in the nature of imparting a truth or an uplifting idea. And that’s what we’re delighted to be doing with this upward-focused new expression of drama. In their working life, Marcel and Connie Hernandez are the founders and co-directors of a thriving naturopathic medical practice in Mountain View, California. you can visit Pacific Naturopathic here.